Overview: Customizable Fingerprint Lock that actually locks your phone! Customizable Fingerprint Lock that actually locks your phone! Get the only fingerprint scanner lock that actually works as a lock screen and uses your own wallpaper! Simply run the app and your normal lock screen will be disabled until you exit the app. This app includes large, visible time and date and Customizable Features, including Themes and Fonts. Your own wallpaper will be shown behind the lock screen, even Live Wallpapers! Invalid identity scans will be denied access to prevent intruders. However when you scan your own thumb print, you will be granted access quickly and easily. Access the settings menu to customize and personalize the Fingerprint Lock screen to your liking, including options to disable sounds, vibration, show or hide the date and/or help button, to change themes, or to change the font of the time and date. - Actually locks your phone! - Large, easy to read Clock and Date! 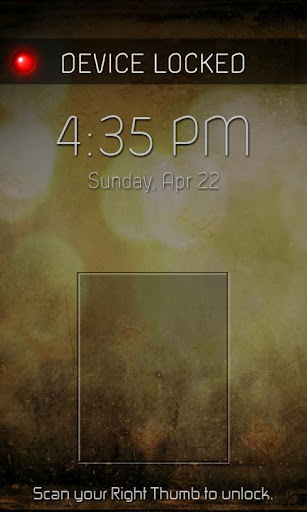 - Many fonts and themes to customize your own personal lock screen! - Shows your own personal wallpaper, including Live Wallpapers! Note! - This app does not actually scan your fingerprint. That is impossible. It works great as a lock screen, but is great for pranks, jokes, and fooling people. There is a hidden button that will toggle access to the phone. After toggling access to allow entry, you can either scan and be granted access, or you can enter the settings menu. This is all explained in the app by clicking the "Help" button. I am not liable for any actions involving the use of this app and can not guarantee that no one will be able to access your device while using this app.